Its a useful triple confluence (channel support, holding above March highs and behaviour similar to the last QE announcement), because a decisive breakdown would swiftly provide 3 reasons to be bearish (i.e. triple confluence failure). I say decisive breakdown, because the market can sometimes make a fakeout to flush out the weak hands, so I’d want to see a couple of consecutive closes beneath the marked zones, to give more weight to the bearish alternative. The positive pressure around Monday’s new moon is still in play if the market can rally today and early next week, which gives us another reason for a renewed rally without delay, if it is going to happen. The correction so far has largely neutralised indicators, such as II investor sentiment (now more bears than bulls), stocks above the 50MA (now back beneath the mean), and bullish percent / call put (neutral zone). If the correction is going to be a full flush out (or a new bear), then we’d expect these indicators to go all the way to extreme oversold/bearishness, but if this is just a consolidation in an uptrend then they have reset enough to push on again. I am still in the continued uptrend camp, and still expect the SP500 can reach around 1600 before keeling over. I maintain that because we don’t yet see the typical evironment for a cyclical bull market top (yields rising, inflation rising, leading indicators in a renewed downtrend, economic surprises in a downtrend, negative breadth divergence, etc) and that there is growing evidence of reflation. 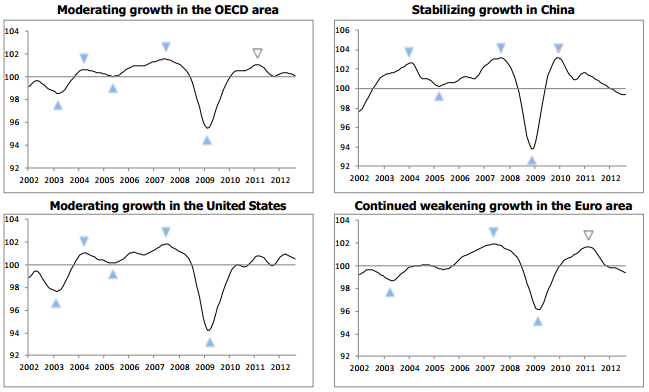 The horizontal lines represent historic average growth, not a growth/recession divide, but nevertheless they don’t paint a picture yet of a global economy in resurgence. The particular bright spots in their report were Brazil and UK. There is a potential trend change in China occurring as shown, and the Shanghai stock index continues to look like it may be breaking out of its long term downward trend, plus the Baltic Dry index has risen 40% over the last couple of weeks, so I continue to watch these. Yesterday grains had a bumper day as the latest US Department of Agriculture report suggested stockpiles will drop more than expected due to the adverse weather conditions and continued robust demand. 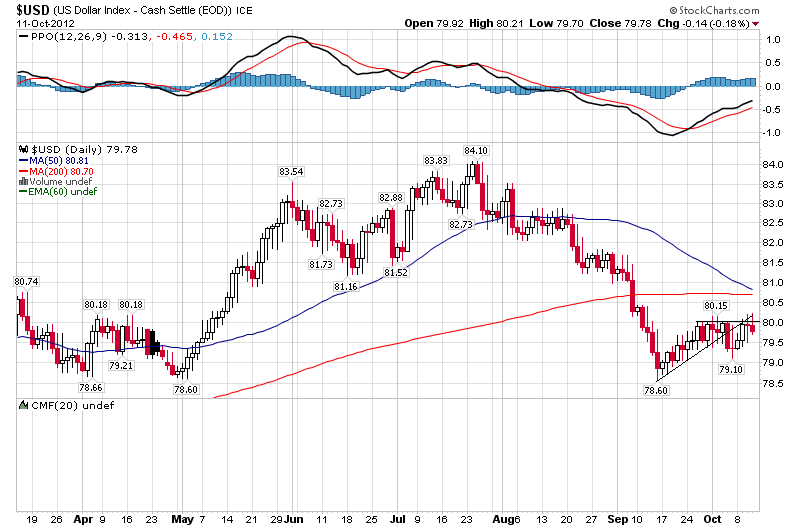 And the US dollar index made an inverse hammer candle at both horizontal and diagonal resistance. That’s only significant if there is now follow through, so again my focus is on how pro-risk and safety behave the next couple of sessions. Interesting article about Arch Crawford’s belief that a crash is imminent based on planetary alignment. Thanks. His record is very hit and miss. He also forecast crashes Dec 2011 and Aug-Oct 2010, both fails. My delve into astro produced a correlation between Earth, Venus, Jupiter and solar activity and therefore the market, but not the other planets. So I can’t give weight to his current call which is based on Mars and Uranus. Just by saying “there will be a crash by February 2013” makes the actual event much more likely than if someone said nothing at all. Without the empirical proof to prove a crash will occur, he’s simply thinking “I think there ought to be a negative period for stocks by February 2013, so I’ll try to scare gullible traders into selling until the given date.” It’s manipulation of the nastiest kind. People like this benefit from scaring people into selling shares at a point where they should probably hold on to them in the long run. There might be a crash by February, but there’s always a chance that within a decade, you’ll have twice what you invested in the first place. Stocks tend to keep value over a long time, and what this man is trying to do is spook people into selling so he can buy their shares at a lower price, and then when the situation picks up, he’ll sell them at a far higher price. Don’t let yourself be fooled so easily by such people. Arch and his “crash” calls cost me alot of money in the past (of course if you “keep” doing it you’ll eventually be correct). Wasn’t too long ago it was his Cardinal Climax that was going to take everything down (he called it for months and all we did was continue higher). IMO, don’t listen to him as it’ll cloud your thinking (I know from experience). Precious metals have rallied for 2 months after breaking out of an 11 month consolidation. Given that 11 month energy building, and gold’s seasonally strong period of Sep-Feb, I don’t expect the current pause to be deep or long. Gold stopped at the 1800 horizontal resistance on frothy open interest and sentiment readings, and is now working that off a little. By Gann, the forecast was for gold to make a strong rally into October to around 1900. It is there by time but not by price. Developments in other assets will play into it – we’ve seen gold correct along with equities and oil here. If those risk assets can resume an uptrend then it is more likely gold will also regain momentum. Jobless claims improved again – does this chart look like the US is in or heading for recession currently? Consumer sentiment improved and beat expecations – again does this look like previous recessions or a run into a recession? Again, no resemble at all to previous recessions or the run into a recession. One thing that is interesting is the Monetary Base growth in certain countries relative to the United States. The ratio’s of monetary base from the US to other countries have been dropping, that is as other Central Banks outside of the Fed are growing their base. Comparing this on a historical basis to an exchange rate, the monetary base ratio figures have been leading indicators to where an exchange rate is heading. On the demand side, just looking at factors such as GDP or Interest Rate differentials, more recently it has been hard to find traders excited about a single G10 currency, maybe outside of the Kiwi. The Fed obviously has QE3 now in effect, so it should be interesting to see how this affects the ratio’s. Watching many currency traders focus on the demand for the currency, I believe in this environment of global stagnation to slowdown, the supply (a general term) is more important. There are not many valued carry trades, maybe outside of AUD/USD and AUD/JPY however with where China is in their cycle, many have left the idea of holding on to a carry trade just to collect 3% give-or-take. This could be a telling story as we move forward in a slower growth environment. As the “race to debase” continues, money supply figures should become a larger focus than they normally receive. Just looking at the monetary base and central bank balance sheets recently (G10), much of their supply is overwhelming any demand that may exist for said currency.